One of the most common themes found in science-fiction is human augmentation, which is the concept of surpassing the limits of the human body through artificial means. Now, this piece of fiction is closer than ever in becoming a reality as researchers turn to 3D printing and wearable electronics to combine the natural with the artificial. Recently, Michael McAlpine, a professor from the University of Minessota demonstrated a method of directly printing electronics onto human skin. 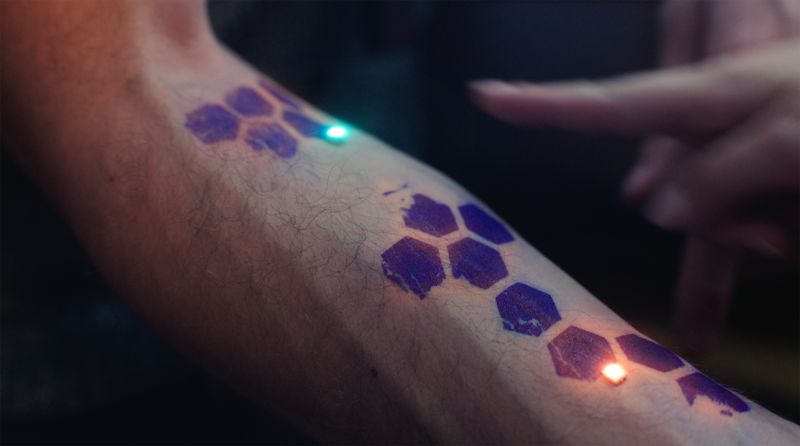 According to McAlpine, these "e-tattoos" can serve as the next generation of smartphones and computers. After all, having the electronics you need literally at your fingertips is more compact and convenient than carrying a multitude of devices around with you. Apart from e-tattoos, McAlpine and his team are also working on innovating modern 3D printing. Rather than working with hard plastics, they are planning on using so-called "functional materials" for 3D printing. These materials can be anything with practical use, from soft polymers to biological cells. By making use of these readily-available resources, the research's proponents hope to create 3D printers that can easily make life-saving devices in the field, which will have great impact in the fields of medicine and emergency response. Currently, the prototype e-tattoos made with this technology are only used to seamlessly interact with other electronic devices. However, in the near-future, McAlpine hopes that 3D printing technology can realize the concept of "augmented organs" - which are partially or completely synthetic 3D-printed structures that can be integrated safely in the human body, either as a transplant organ or for enhancement purposes.